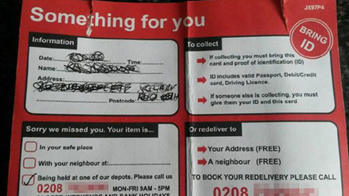 Warnings have been raised around a new scam which makes use of convincing - but fake - 'missed delivery' cards. The cards look very much like the ‘something for you’ cards you typically receive from Royal Mail when you have missed a delivery. They use the same colour scheme, headings and four-box layout. Indeed, the only clear difference is that the scammers’ cards do not have the Royal Mail logo on them. Recipients are invited to call a number beginning 0208 in order to arrange a delivery. They are then put through to an automated message where they are asked to leave their details and a ‘consignment number’. Victims have claimed that calling the number - which isn’t registered to Royal Mail - has cost them £45. So if you do receive a missed delivery card, make sure that you look for the Royal Mail logo and be especially wary if you are not expecting a delivery.